Yes, yet another way to use Polenta! This time in sweets. 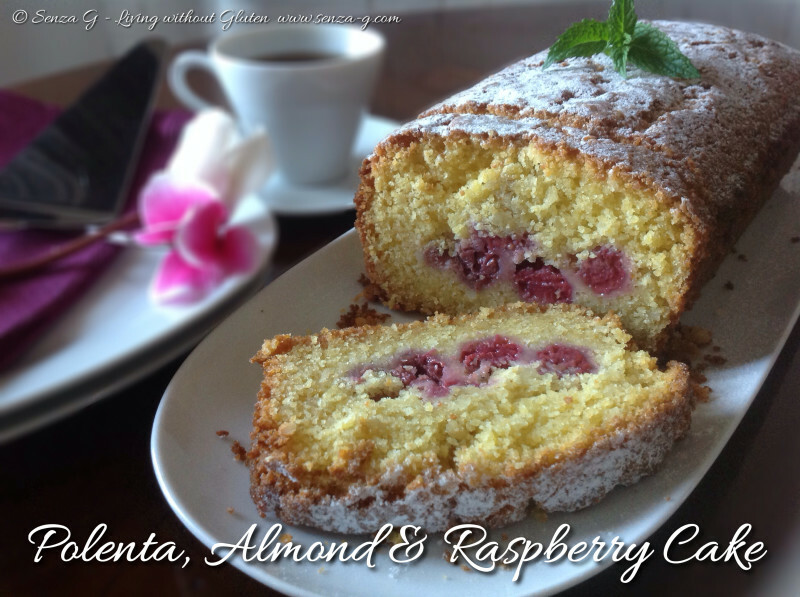 A slice of this cake goes down really well with a cup of tea or coffee in the afternoon! And it is incredibly quick and easy to prepare! Preheat oven to 180C. Grease a plum cake tin and set aside. Lightly dust the raspberries with cornflour which will help prevent them sinking in the batter. Using a hand held mixer, beat the eggs with the sugar in a large mixing bowl for a few minutes. Add the polenta, the cornstarch, the almond flour, the kibbled almonds, the vanilla essence, the milk and finally the butter and beat again until all the ingredients are combined and the mixture is smooth. Pour half of this batter into the greased plum cake tin. Put a layer of raspberries all along in the middle and then pour the remaining batter. Place in the oven and bake for approximate 50 to 60 minutes or until a skewer, when inserted in the cake comes out clean. Leave to cool before removing from the tin. Sprinkle liberally with icing sugar on top.